Your head shower is getting old, has lime marks and the water doesn't run through properly anymore or it just doesn't look nice anymore? Take the opportunity and exchange your old shower head for a new one. You can simply replace the head shower yourself within a short time and soon restart the shine in your bathroom and enjoy a completely new shower experience. What's so special about the GROHE Euphoria head shower? 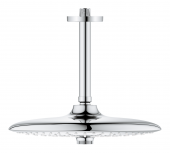 The Euphoria head shower has three types of jets: Jet-Ray, Rain-Ray and SmartRain-Ray. The circular Jet ray is particularly good for washing shampoo out of your hair. The Rain jet envelops you like a warm summer rain. 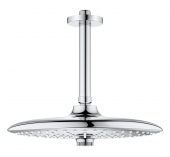 The jet types are changed by means of a diverter located in the center of the shower. By turning, the jet types are gradually added until finally the full width is reached.